An exceptional yet simple layered Vegan Cake with subtle Earl Grey fragrance & fluffy, buttery, lemony frosting. It can be made as a 3 layer cake, a 2 layer cake or even 6 muffins. You will find full instructions for all 3! I haven’t published a cake recipe since my Maple Walnut Cake on A Virtual Vegan’s first birthday in 2016. My plan was to make a tradition of creating a decadent vegan cake recipe to mark that occasion every year. That didn’t happen on AVV’s second birthday because I ended up in the hospital, so I decided to make one for my own birthday this year. We happened to be on vacation for that, so this rather exquisite Earl Grey Vegan Cake with Lemon Frosting is coming at you one week later. It really is worth the wait though! It might look extravagant, but this cake isn’t much more difficult than making a quick bread, except that you need to quickly whip up some frosting too. And I know it’s pretty big (try getting your mouth around one of those 3-layered slices ???? ), but I have also included instructions to adapt it to make a 2 layer cake or even 6 muffins for those of you who aren’t super-duper greedy or who don’t have the 5 thousand to feed. I’ve certainly been keeping the neighbours happy while I’ve been testing this recipe. They will probably be disappointed to hear that I will no longer be turning up on their doorstep every day with a slab of cake on a plate! There are just a few simple steps to making this vegan cake. First you need to make some very strong Earl Grey tea. I had the the pleasure of working with this wonderful Eva Tea Set from Maia Ming Designs when making this Earl Grey Vegan Cake. The Eva Tea Set is absolutely beautiful, but also functional and versatile. I drink tea everyday so the tea pot has been getting lots of use, but we are also big coffee lovers. We treated ourselves to a Breville Barista Express Espresso Machine in a sale a few months ago and the Eva tea cups are the absolute perfect size for a double shot of espresso with just the right amount of hot water. The platter is roomy and perfect for serving up small baked goods alongside your tea, but also could be used alone for serving cakes, muffins or other treats when you have guests over. We tend to drink our tea and coffee black, but the milk pitcher has been used for serving maple syrup on our pancakes. You will see it featured in the photos of my next recipe! Drippy pourers are a pet hate of mine and I have owned many. It’s always the first thing I take note of when I use new tea pots, pitchers or jugs. 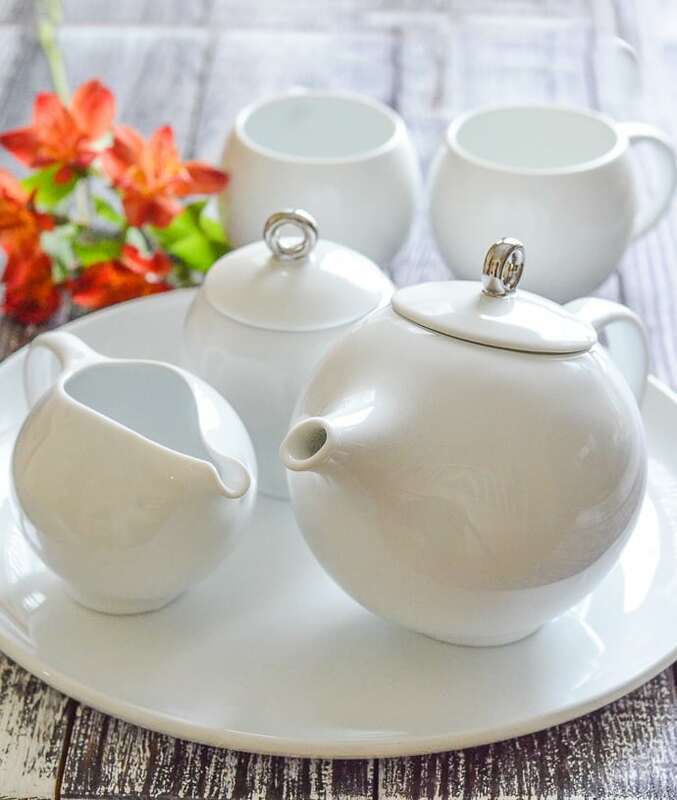 The pouring quality of a lot of them isn’t great, but with the Eva tea pot and pitcher, thought has not only gone into the look, but also the functionality. They pour absolutely perfectly! After making the tea, let it cool slightly then get on with the baking! Much like non – vegan cake, you start by whipping the vegan butter and sugar. Then gradually add the aquafaba (my ingredient of the moment. I seem to have used it a lot recently! In case you aren’t familiar, aquafaba is the liquid from a can of chickpeas. It might sound very odd but it is the perfect egg replacement in vegan cake and muffins. It gives such tender, soft results, much better than flax eggs or chia eggs so please don’t consider subbing it for one of those. And if you need a way to use up the chickpeas you will find many recipes using them in my recipe index. Just type ‘chickpeas’ into the search bar! Next you add the dry ingredients, followed by the liquid which is a mixture of the Earl Grey tea and some plant-based milk. Stir gently, pour into pans and you’re done! This is what you’ve got to look forward to ???? So perfect. So decadent. Amazingly yummy. The sponge is light, soft and fragrant. Taste testers had absolutely no idea this was a vegan cake! It would make the perfect vegan celebration cake. 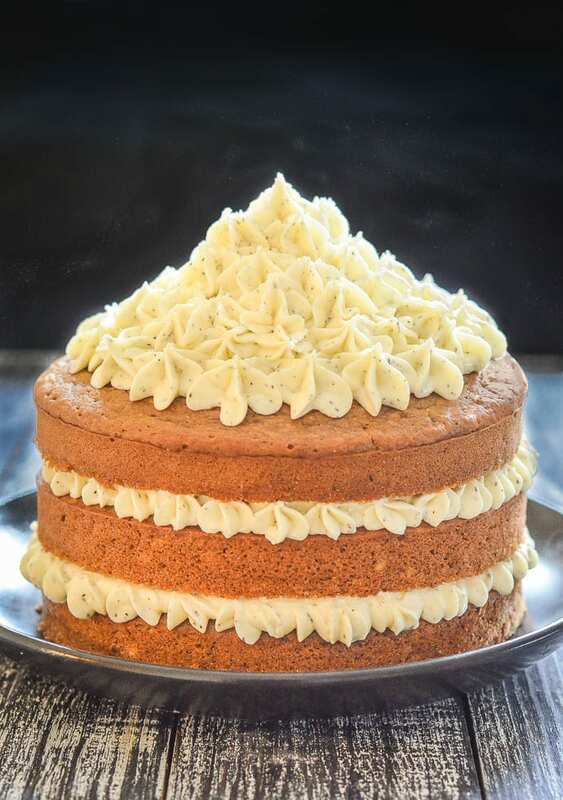 The Earl Grey flavour is subtle and the buttery lemon frosting compliments it perfectly. I chose to split an Earl Grey tea bag and mix it into my frosting as I think it looks really pretty, but after running a poll on my Instagram it seems not everyone agrees. It is purely optional so add the tea leaves only if you want to. They don’t really add any flavour, it is just for aesthetics. Don’t worry about the texture. You can’t detect them at all. 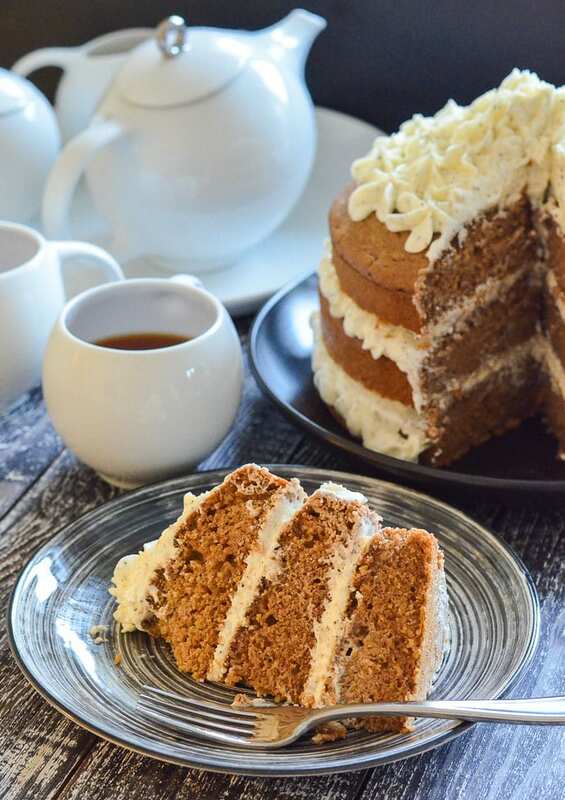 This Earl Grey Vegan Cake is perfect served with a cup of tea alongside. As I am British, perhaps I should be recommending you make it and serve it as part of a decadent Afternoon Tea. Truth be told, the only afternoon tea I have ever had was here in Canada for my 40th birthday. ???? 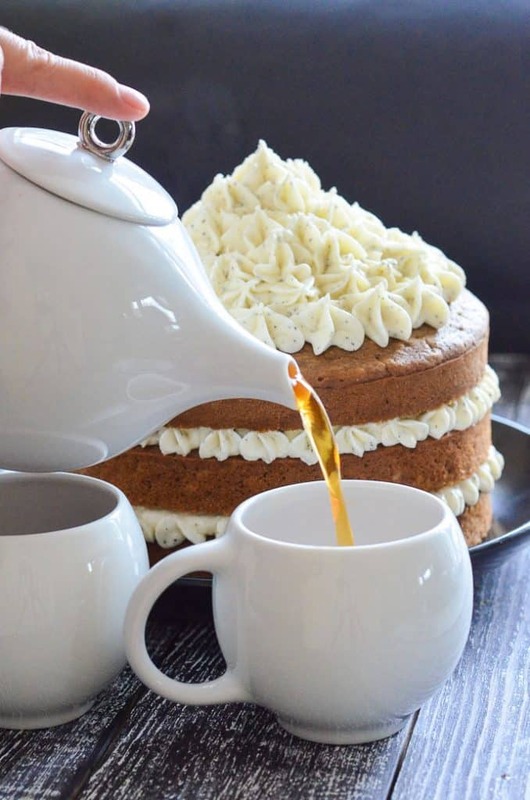 You must give this Earl Grey Vegan Cake with Lemon Frosting a try! Share a pic with me on Instagram when you do. I’d love to see. And don’t forget to enter my giveaway which you can find below the recipe. 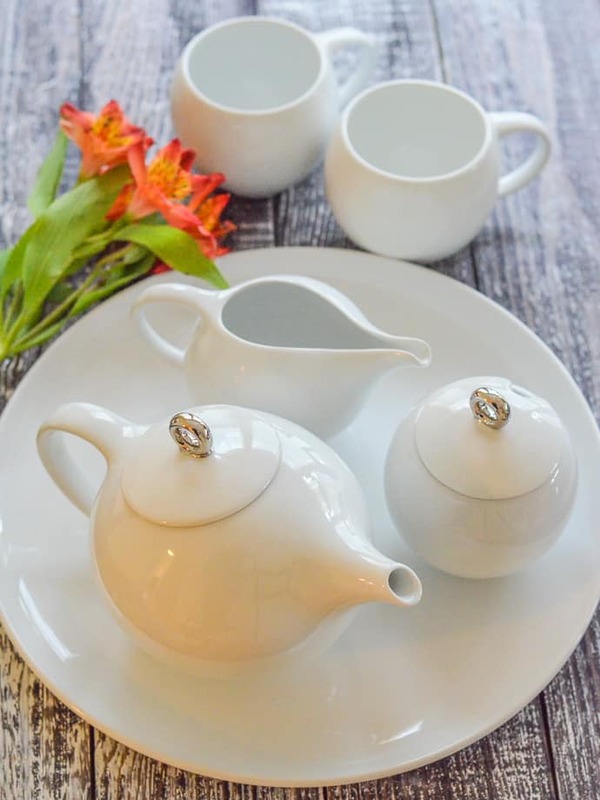 You could be serving up afternoon tea in true British style, with your very own Maia Ming Designs Eva Tea Set! And if you love the elegant, whimsical style of Maia Ming Designs, be sure to follow on Facebook, Instagram and Twitter! 9 Earl Grey tea bags , I like to use Earl Grey tea that is flavoured with pure bergamont oil rather than natural flavouring. 120g / ¾ packed cup vegan butter , cold & hard straight from the fridge. I use my own recipe which I link to here, but have also tested with Earth Balance which worked just as well. I don't recommend using Becel Vegan or any other vegan butter that tends to be really soft straight from the fridge. 300g / 1½ cup sugar , light coloured cane sugar is best. Don't use brown sugar or coconut sugar. 9 tablespoon aquafaba , the liquid from a can of chickpeas. I do not recommend subbing this for any other vegan egg substitute. Aquafaba works way better and gives much softer, lighter results. 615g / 4½ cups unbleached all purpose flour , or cake flour. In the UK use plain flour. If using cup measurements, spoon your flour into the cups with a spoon then gently level off with the back of a knife. DO NOT scoop up the flour. 80g / ½ packed cup vegan butter , cold & hard straight from the fridge. I use my own recipe which I link to here, but have also tested with Earth Balance which worked just as well. I don't recommend using Becel Vegan or any other vegan butter that tends to be really soft straight from the fridge. 200g / 1 cup sugar , light coloured cane sugar is best. Don't use brown sugar or coconut sugar. 6 tablespoons aquafaba , the liquid from a can of chickpeas. I do not recommend subbing this for any other vegan egg substitute. Aquafaba works way better and gives much softer, lighter results. 410g / 3 cups unbleached all purpose flour , or cake flour. In the UK use plain flour. If using cup measurements, spoon your flour into the cups with a spoon then gently level off with the back of a knife. DO NOT scoop up the flour. 40g / ¼ packed cup vegan butter , cold & hard straight from the fridge. I use my own recipe which I link to here, but have also tested with Earth Balance which worked just as well. I don't recommend using Becel Vegan or any other vegan butter that tends to be really soft straight from the fridge. 100g / ½ cup sugar , light coloured cane sugar is best. Don't use brown sugar or coconut sugar. 3 tablepoons aquafaba , the liquid from a can of chickpeas. I do not recommend subbing this for any other vegan egg substitute. Aquafaba works way better and gives much softer, lighter results. 205g / 1½ cups unbleached all purpose flour , or cake flour. In the UK use plain flour. If using cup measurements, spoon your flour into the cups with a spoon then gently level off with the back of a knife. DO NOT scoop up the flour. 160g / 1 packed cup vegan butter , cold & hard straight from the fridge. I use my own recipe which I link to here, but have also tested with Earth Balance which worked just as well. I don't recommend using Becel Vegan or any other vegan butter that tends to be really soft straight from the fridge. 1 Earl Grey tea bag (the contents of) , optional - only use if you don't mind the dark coloured flecks in your frosting. You could use lemon zest instead or just omit completely. 106g / ⅔ packed cup vegan butter , cold & hard straight from the fridge. I use my own recipe which I link to here, but have also tested with Earth Balance which worked just as well. I don't recommend using Becel Vegan or any other vegan butter that tends to be really soft straight from the fridge. about ⅔ Earl Grey tea bag (the contents of) , optional - only use if you don't mind the dark coloured flecks in your frosting. You could use lemon zest instead or just omit completely. 53g / ⅓ cup vegan butter , cold & hard straight from the fridge. I use my own recipe which I link to here, but have also tested with Earth Balance which worked just as well. I don't recommend using Becel Vegan or any other vegan butter that tends to be really soft straight from the fridge. about ⅓ Earl Grey tea bag (the contents of) , optional - only use if you don't mind the dark coloured flecks in your frosting. You could use lemon zest instead or just omit completely. Begin by making the tea. Put the tea bags into a small jug and cover with boiling water. Press the bags with the back of a spoon a few times to squeeze all of that flavour out then let it steep for about 15 mins. Remove the tea bags then measure the tea. 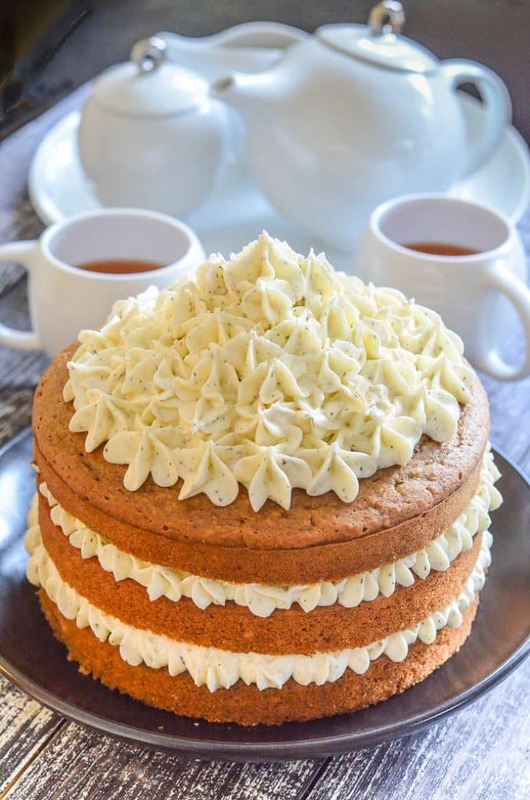 You need 1½ cups (360mls) of tea for the 3 layer cake, 1 cup (240ml) of tea for the 2 layer cake and ½ cup (120mls) of tea for the 1 layer cake or 6 muffins. You should have almost exactly that once you remove the bags and measure. They tend to absorb all of the extra water but if it's a bit over, discard the extra or if it's a little less, top it up with a drop more water. Grease the required number of 8 inch cake pans then cut a circle of parchment paper and put it into the bottom of each pan. This makes the cake removal once baked super easy. You can place the pan ( or the loose bottom insert) on the parchment paper and draw around it then cut to fit. If making muffins line your tin with muffin liners. Put the brewed tea (it doesn't matter if it's still warm), the milk, the vanilla extract and the vinegar into a large jug and stir to combine. Sift the flour (not essential but it does make the cake slightly lighter) into a bowl and whisk in the salt, baking soda and baking powder. Beat the vegan butter and sugar together until light and fluffy. I used my stand mixer but an electric hand mixer would work well or you can do it by hand. Once fluffy, gradually add the aquafaba while mixing. If the mixture splits a little bit don't worry as it will make no difference to the end result. While mixing on a very low speed, or gently by hand, add the flour mixture to the fluffy sugary butter mixture in 3 three additions, alternating with the milky tea mixture, beginning and ending with the dry ingredients, and mixing each addition just until incorporated. Do not overmix the batter. Just continue until there is no dry flour visible and most of the lumps are out. A few small ones are fine. The batter should be velvety, and slightly thick. Divide the mixture evenly between the cake pans. If you have a kitchen scale you can weigh each tin so they are exactly the same. If not add the same amount of scoops to each tin so that they will all cook for the same amount of time. Bake on the middle shelf of the oven for 32-37 mins or until baked through. To test, insert a toothpick into the centre of the cake. If it comes out clean, it is done. If making muffins bake for 22-25 minutes or until a toothpick inserted comes out clean. Leave the cakes in the pans on a cooling rack for about 5 minutes then remove, peel the baking parchment off the bottoms and return to the cooling rack until completely cool. Do not attempt to frost or assemble if they are even the slightest bit warm. Beat the powdered sugar, butter, salt, lemon juice and the tea leaves (if using) together until soft, fluffy and well combined. Add the powdered sugar gradually to avoid it poofing up into a cloud and scattering everywhere! Once done place in the fridge to firm up before trying to pipe with it and if it gets too soft during piping, return the bowl and the piping bag to the fridge for 10 mins or so to firm up again. Feel free to cut each of the cakes perfectly level before frosting if you like. I personally don't as I don't like to waste anything. 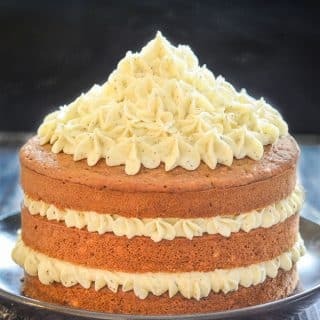 If you do level them, I recommend not levelling the top layer if you are decorating it like me as the slightly domed shape helps the height of the frosting towards the middle of the design. Decorate the cakes with the frosting as desired. I used a large open star piping tip to get the pattern on the top and around the edges between the layers. I spread the frosting between each layer with a spatula then piped just around the outside edge before putting the layer of cake on top. On the top I started at the outside and piped all around, gradually moving inwards. Towards the middle I increased the height of the frosting by piping slightly more each time and made the swirls a few layers high. If you don't want to pipe it, just spread it all over evenly with a spatula. You could decorate it with a scattering of lemon zest to add some interest in place of frosting swirls! Nutritional information is calculated for a 3 layered cake with frosting. If you make a 2 layered cake the calories will be approximately 353 per slice, and for a 1 layer cake around 176 calories based on 14 slices per cake. If you make 6 muffins with frosting they will be approximately 410 calories each. 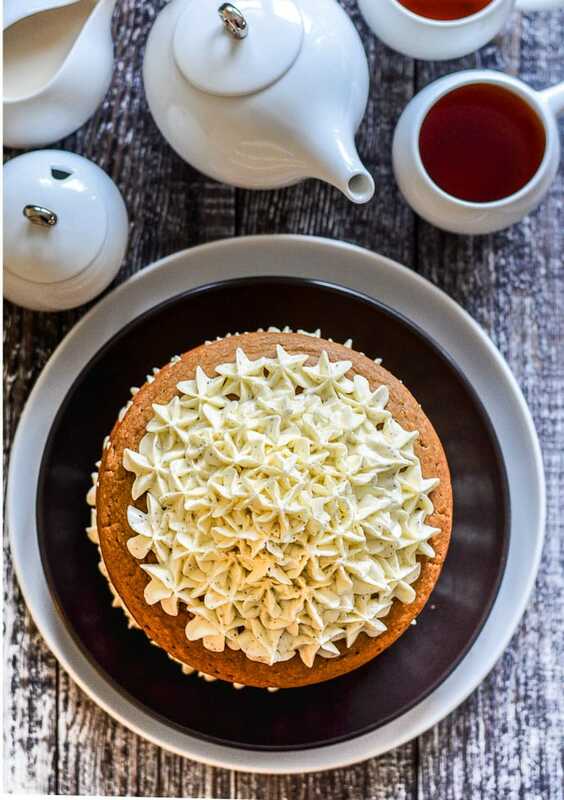 This Earl Grey Vegan Cake recipe is sponsored by Maia Ming Designs. Thank you for continuing to support the brands who help make this site possible. This looks amazing! But I don’t do any kind of processed sugar or sweeteners! I generally stick to organic maple syrup or raw honey. Both the cake and the icing have regular and powdered sugar. Do you think it would work for either or hopefully both, to use maple syrup or something other than sugar? Sugar is important for structure, tenderness and moistness in sponges. If it’s removed the cake won’t be the same. Maple syrup might well work, but I haven’t tested it so can’t say for sure, and other ingredients would need to be adjusted too to make up for the extra liquid. As for the frosting, nothing else will work except powdered sugar or maybe an artificial sweetener kind of alternative but I have no experience of those because I never buy them. There are recipes out there for whole foods, plant-based frosting that might suit you better. To be completely honest though, if you don’t eat sugar, this recipe probably isn’t the best one for you. Hope that helps! This recipe is great and I use your butter recipe religiously! Ha. Unfortunately I always have an issue making buttercream and I am hoping for advice! My issue is that it always ends up becoming grainy to where I can taste the texture of the almond flour. It’s splits from the other ingredients and tastes extremely greasy as well. How can I avoid this? I’ve tried making buttercream with cold butter straight from the fridge as well as letting it get to a cool room temp. I keep trying to find answers but I figured it’s time to come to the source since it is your recipe!! Thank you! I’m glad you are enjoying the cake recipe. With regards the frosting, if you are getting the texture of the almond flour when making the frosting, it sounds like the butter wasn’t blended well enough to start with. It should have a completely smooth texture, just like store butter kind of texture. If it isn’t, when you go on to make the frosting it will be slightly grainy. Maybe try blending the butter longer when you make it. I’ve never had frosting split before. When I make frosting, I always use cold butter and I usually use an electric hand mixer. It sounds like it might be getting too warm when you make it. Are you beating it for too long? It needs to stay cool and the longer you keep mixing, the warmer it will get. If it starts getting too soft, just pop it in the fridge for 10 minutes then try again. If it’s really warm in your kitchen you can try having the bowl sitting inside another bowl that has ice in it to keep everything cold. You could try leaving the lemon juice out until later too. That might help. Mix it all up without it, and once the frosting is at the right consistency then add it gradually. And if it gets little soft then, add some more powdered sugar. Hope that helps! There are a few reasons this might have happened. First of all oven temperature is often a reason cakes cracks. If it’s too hot. Was the oven definitely at 350f? Some ovens run hot. It’s worth testing with an oven thermometer if you think this could be the case. Or did you cook it in the top half of the oven rather than the middle shelf? 2nd reason is opening the oven door before it’s done. Is there a chance you peeked at it at some point during baking or thought it was ready when it wasn’t then returned it to the oven or did you cook it in the top half of the oven rather than the middle shelf? And thirdly too much leavener. The amounts I give are correct, but if you did not weigh your ingredients there is a chance the leavener to flour situation was off. I always recommend weighing cake ingredients rather than using cups. Lastly, did you use exactly the same pan size? 8 inch. If not and it was deeper, this would increase the chances that the crust would form before the insides of the cake are even close to being cooked, then as they cook and rise it makes the crust crack. Can I use egg replacer powder? Thank you. It’s not something I have ever used so I have no idea. I would highly recommend using the ingredients I list as that’s how the cake has been tested. If you change them I can’t guarantee results. Aquafaba would be very hard to beat in baked goods like this. It gives perfect, soft crumb results. Yes. There are a few reasons. Firstly coconut sugar changes the flavour. It works in some cakes but with this one, you go to the trouble of infusing the sponge with the subtle Earl Grey flavour and you don’t want it covered up by rich caramel-y coconut or brown sugar. Cane sugar or white granulated sugar don’t really add any flavor so are best for that reason. Different sugars affect the bake as well. As much as I love coconut sugar, cakes don’t rise as much when you use it and the texture of the sponge isn’t quite as good. You can see what I mean here if you have time to have a quick look: https://www.cookinglight.com/eating-smart/nutrition-101/same-cake-different-sugars Hope that helps! Hey ! I’m very interested by making this recipe but can you tell me that if I can reduce or partionnaly replace the amount of butter (if the butter have an important role in the cake) ? Hi Lucile. The pans I used were 8 inches in diameter and they are about 2 inches high. As for the butter, I try to limit how much I use myself, and when testing the recipe, I reduced it as much as I could without affecting the texture and flavour. I wouldn’t recommend reducing it anymore as you won’t get such a good result. Hope that helps. Enjoy your baking! I have another question: I have bergamot essential oil, can I use it instead of the earl grey tea bags ? If it’s definitely food grade essential oil then you could but be very careful how much you add as it is really strong. Probably only a drop or two would be needed. It would be best to make the batter with the tiniest amount, then add a drop or two more to taste once it’s all mixed up so you don’t accidentally add too much. Bear in mind that if you don’t use tea bags and just use the oil, the flavour of the cake will be different because Earl Grey tea bags contain black tea too. I’m sure it would still be really good though! This recipe is fantastic and was super easy! I used the 2 layer recipe to make 12 jumbo cupcakes – baked for 23 minutes and they worked out perfectly. I only had vegan becel so the icing was a bit soft but still tasted delicious. Definitely one I’ll be saving to make again and again – thank you! That’s awesome! It’s such a shame Becel is so soft. They should make a harder version for baking. I’m so glad you enjoyed it anyway and thank you so much for coming back to let me know. I appreciate it! This cake sounds absolutely incredible, and I can not wait to try out. Do you think I could substitute lemon juice for the apple cider vinegar to give the cake a lemony flavor as well? I’ve been looking for a good vegan lemon cake recipe but am having trouble finding one I like. Thank you Kylie. Yes you could replace the vinegar with lemon juice. The acid reacting with the baking soda is what helps the cake rise and become light and fluffy and lemon juice acts in the same way as vinegar so it will be fine. You could also add some lemon zest to the batter to make it even more lemony and if you wanted to go all out, you could replace the vanilla extract with a natural lemon extract as well. Hope that helps! That sounds perfect! Thank you so much for your suggestions! I made this and it’s amazing! Quite possibly the best vegan cake recipe I’ve tried so far. Wow thank you Kylie. I am so glad you enjoyed it! Thank you for coming back to let me know! I’m new to veganism and I have to admit that I was rather skeptical about cake sans butter and eggs- but it was delicious!! It was fun to make and the frosting did well in the piping bag! I’m so happy to have found this recipe and this blog! I’ll definitely be trying more recipes :) Thank you!!!!!! Yay! I’m so glad you enjoyed it Alison. I’m also glad to have converted a vegan cake sceptic ;o) Thank you so much for coming back to leave feedback. I really appreciate it! I haven’t tried it gluten-free but I think it might work ok with very finely ground oat flour or with a gluten free blend. I can’t guarantee though as, as I said I haven’t tried it. If you do give it a try I would make the smallest version of this cake just in case things don’t go to plan, and I would double the baking powder and the baking soda to give it a bit more lift that will be lost with the lack of gluten. If I get a chance I will try it myself at some point and update the post if it works ok. Sorry I can’t give you a definitive answer! Such a beautiful cake!! Looks delish!! I will have to try the GF suggestions and see what happens! Thank you! This is beautiful and sounds so tasty! This cake is absolutely gorgeous! And I can image how delicious it tastes with the Earl Grey and lemon. Mel, this cake looks fantastic!!! I absolutely adore the taste and the smell of Earl Grey, it’s literally one of my fav things in the world, and seeing this cake now, I just now one thing- I MUST TRY THIS!!! 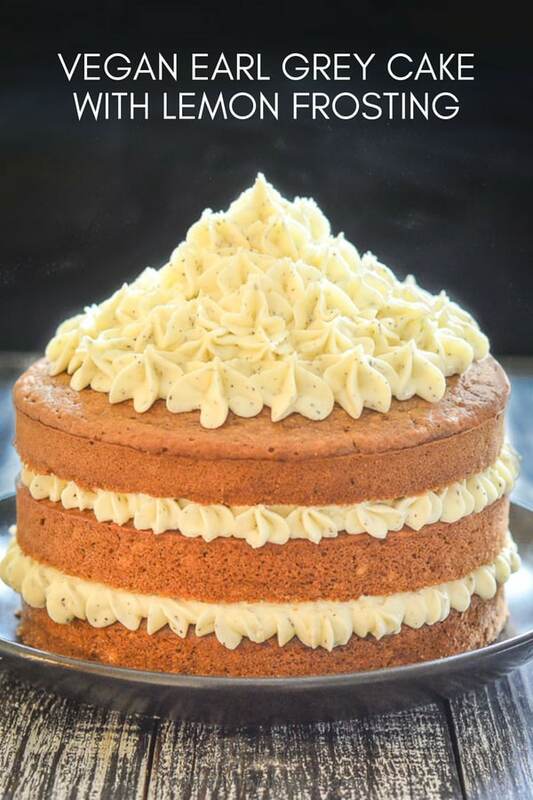 If you love Earl Grey you will adore this cake! Let me know what you think if you try it! The cake was super delicious Mel. Light and perfectly textured, i could not tell it did not have egg or butter. Being the neighbour who happily received this delicious surprise, I am a little disappointed it will be another year before i get another cake surprise. Thanks Mel. I love Earl Grey tea so I think I’ll have to give this a whirl! 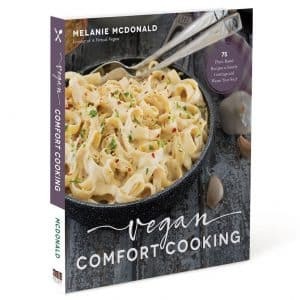 Not sure what to use for Vegan butter tho – we don’t have your brands here in Australia and the Vegan margarine my family use on toast etc is that soft spreadable texture you don’t recommend. Do you think Coconut Butter (aka Creamed Coconut) would work? Mine won’t be decorated so extravagantly either but yours looks brilliant! Thank you Jane! I think coconut butter might ‘work’ technically in the cake batter but the Earl Grey flavour is quite subtle anyway, and with coconut butter in the mix too I think it might get drowned out. I’m also not sure it would work well in the frosting. If you can’t buy any harder vegan butters then I’d really recommend you make my butter recipe. It takes literally a few minutes to do then just needs some setting time in the fridge. It’s really easy and all you need is a blender. Once you have made it once you wont want to go back to the store bought versions! My recipe makes about 1/2 a cup so you will just need to be sure you make enough for whatever size cake you decide on. 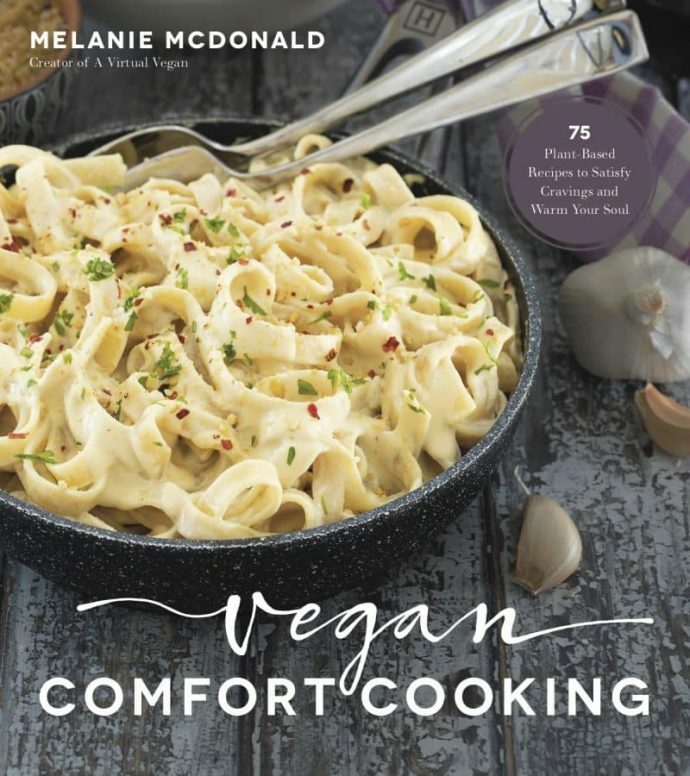 You can find the recipe here https://avirtualvegan.com/easy-vegan-butter/ . I have heard some people in Australia struggle to find refined coconut oil but I have checked online and it seems there are quite a few places that sell it online and ship to Australia. Also Woolworths sell it according to their website. Good luck! 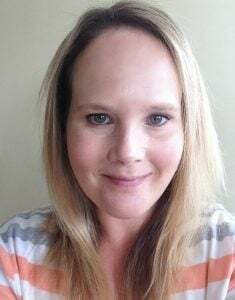 Thank you Aimee, I really appreciate your support! So glad you like the cake. I surprised myself with how pretty it turned out. I’m not usually great when it comes to decorating cakes (or limiting sweets…I feel your pain!) I hope you enjoy it when you get a chance to try it! I haven’t tried it gluten-free but I think it might work ok with very finely ground oat flour. I can’t guarantee though as, as I said I haven’t tried it. If you do give it a try I would make the smallest version of this cake just in case things don’t go to plan, and I would double the baking powder and the baking soda to give it a bit more lift that will be lost with the lack of gluten. If I get a chance I will try it myself at some point and update the post if it works ok. It might also be ok with a good gluten-free blend. I can’t say for sure though. Sorry!